We recommend that investors generally maintain balance across value and growth stocks. Improving economic and profit growth create a favorable backdrop for value. Our sector views point to balanced style views, particularly our positive views of both technology and financials. Other factors to consider include relative valuations (favors growth) and technical analysis (favors value). Despite a strong 2016, there may still be some value in value. 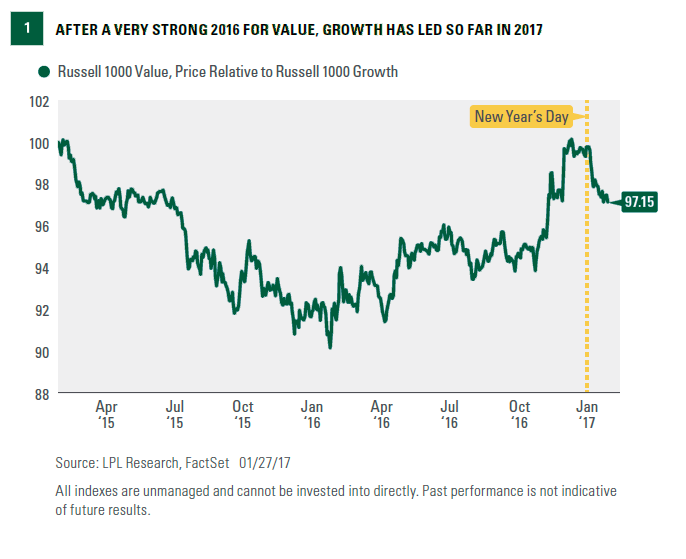 While value has lagged growth so far in 2017, based on the Russell style indices [Figure 1], we see several reasons to like value stocks, including accelerating economic and profit growth, and an improving outlook for the financial sector. But the growth side has enough going for it that we recommend investors maintain balance across the styles. Here we discuss our latest style views. Economic and profit growth are both poised to improve in the coming months in our view, creating a more favorable backdrop for value stocks that have historically outperformed when growth is accelerating. Economic growth has been subpar during the entire economic expansion (approximately 2% growth on average in gross domestic product [GDP]), which is one of the reasons why growth stocks have outperformed value during the current economic expansion. The logic here is that when economic and profit growth is scarce, you want to own stocks that can generate their own growth without the need for a macro tailwind. Value stocks tend to need help from the economy to grow. When all companies get a macro lift, and growth is plentiful, the market tends to prefer cheaper stocks to those that are more expensive. Valuations are another consideration in the style decision, and value stocks appear a bit expensive relative to growth. Although by definition value stocks are always cheaper than growth on an absolute basis because valuations are used to classify the securities, the relative relationship between the two changes. 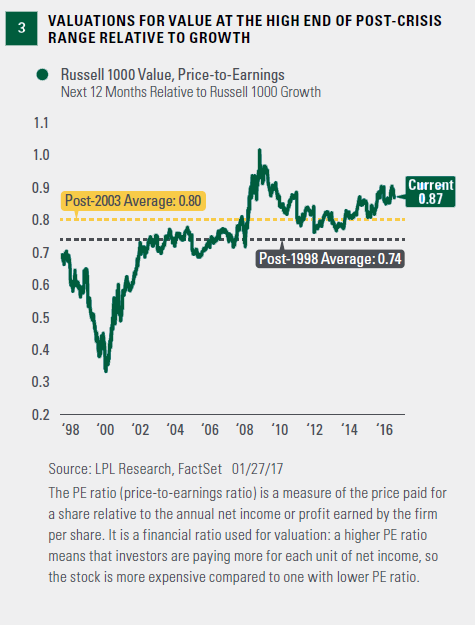 Currently, the Russell 1000 Value Index is trading at a smaller discount to its growth counterpart (13%) than its 20-year average (26%, Figure 3). Even if we eliminate the tech boom — a period when growth was dramatically overpriced — value is still 7% more expensive than its average (a 13% discount vs. the post-2003 average discount of 20%). So although we do not put a lot of weight on valuations for short- term decisions, over the next year or two valuations may present a headwind for value outperformance. 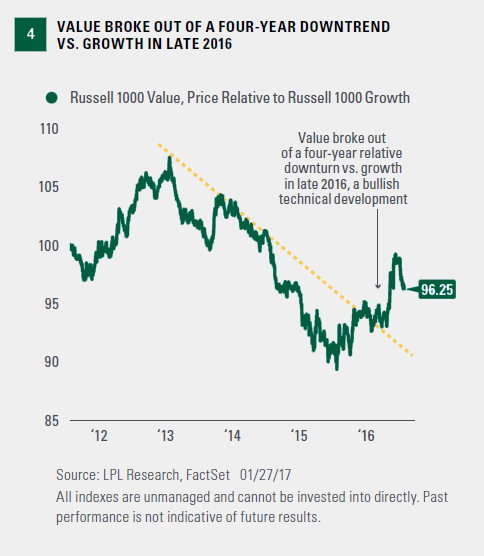 Taking a technical analysis perspective, we observe that the value relative performance line versus growth broke out of a four-year downtrend in late 2016. We believe this positive technical development favors value, although the Russell 1000 Value Index does appear to be working off short-term overbought conditions (a technical way of saying in the short-term, relative performance may be a bit ahead of itself). Nonetheless, strictly from a technical perspective, the extended value underperformance suggests a potential long-term opportunity in value [Figure 4]. IMPORTANT DISCLOSURES The opinions voiced in this material are for general information only and are not intended to provide specific advice or recommendations for any individual. To determine which investment(s) may be appropriate for you, consult your financial advisor prior to investing. All performance referenced is historical and is no guarantee of future results. The economic forecasts set forth in the presentation may not develop as predicted and there can be no guarantee that strategies promoted will be successful. Investing in stock includes numerous specific risks including: the fluctuation of dividend, loss of principal, and potential liquidity of the investment in a falling market. Because of their narrow focus, specialty sector investing, such as healthcare, financials, or energy, will be subject to greater volatility than investing more broadly across many sectors and companies. Commodity-linked investments may be more volatile and less liquid than the underlying instruments or measures, and their value may be affected by the performance of the overall commodities baskets as well as weather, geopolitical events, and regulatory developments. All investing involves risk including loss of principal. DEFINITIONS Gross Domestic Product (GDP) is the monetary value of all the finished goods and services produced within a country’s borders in a specific time period, though GDP is usually calculated on an annual basis. It includes all of private and public consumption, government outlays, investments and exports less imports that occur within a defined territory. Purchasing Managers Indexes are economic indicators derived from monthly surveys of private sector companies, and are intended to show the economic health of the manufacturing sector. A PMI of more than 50 indicates expansion in the manufacturing sector, a reading below 50 indicates contraction, and a reading of 50 indicates no change. The two principal producers of PMIs are Markit Group, which conducts PMIs for over 30 countries worldwide, and the Institute for Supply Management (ISM), which conducts PMIs for the U.S. The Institute for Supply Management (ISM) Index is based on surveys of more than 300 manufacturing firms by the Institute of Supply Management. The ISM Manufacturing Index monitors employment, production inventories, new orders, and supplier deliveries. A composite diffusion index is created that monitors conditions in national manufacturing based on the data from these surveys. INDEX DESCRIPTIONS The Standard & Poor’s 500 Index is a capitalization-weighted index of 500 stocks designed to measure performance of the broad domestic economy through changes in the aggregate market value of 500 stocks representing all major industries. The Russell 1000 Index measures the performance of the large cap segment of the U.S. equity universe. It is a subset of the Russell 3000 Index and includes approximately 1000 of the largest securities based on a combination of their market cap and current index membership. The Russell 1000 represents approximately 92% of the U.S. market.